Android Wear: How to send data from Android Wear to Mobile Device ? Android Wear or Let say Smart Watches are new and trending technology. Android apps are updating and they all comes with Android wear support. if you want it is in your app you can find simple Helloworld wear app tutorials easily on Google. but what if you want to explore it more let say you want to display a List view in android wear or get some kind of input from android wear app. so these tutorial is for you. In this tutorial i have created simple list in android wear app in which user click on list item and an app in mobile device gets open. for example you want to display list of songs in android wear app and on the click of that you want to change song in your device or let say you can display to do list on android wear and on the click of list item you can open to do item details inside your mobile app. this list can be infinite and its totally depends on you and apps in android. First of let i start with adding a android wear module in development. If you have already added android wear module in you app you can skip this step. To add right click on your app root folder (name of your app folder) and go to New > Module. Select Android Wear Module and click on next. 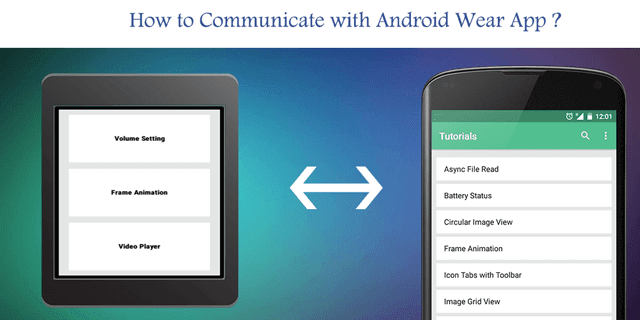 Give same name in Application name (Mobile app name) and in Module Name write wear. so you can differentiate them. Make sure you give same package name also. because when you send some data through mobile app or wear app MessageApi will check for the same package and pass that data. so if you give different name you won't be able to send or receive data. On the next screen select Blank Wear Activity and on the next screen give proper name to it. So our android wear module is added. I hope you have no issue in above steps. in the main activity or launcher activity i have created a List (basically list of my tutorials). For learning purpose you can start with same and after that you can change it is as you want. so put below code in appropriate layout files. Log.e(TAG, "Failed to send message with status code: "
* Created by Wasim on 08-05-2015.